I've been using Herbal Biotic by Vital Nutrients since February 2017 and try to keep it in supply. It is great to have something that is natural. I have recommended it to my family who have tried it and loved it! Great product! Your immune system is a complex‚ wonderful thing composed of cells‚ tissues‚ and organs that work in sync with each other to help ward off illness. Not only does it keep you healthy‚ but it also helps you gets you well again whenever you do get sick. Through what's known as the immune response‚ the immune system seeks out unwanted invaders and destroys them. The white blood cells are the destroyer cells‚ and contain two leukocytes: phagocytes‚ which eat away at the invading organisms; and lymphocytes‚ which remember and recognize past invaders and help destroy them. This protective immunity is essential to your health. Echinacea purpurea‚ an herbal root extract that may assist in prevention and recovery from cold and flu viruses‚ relieve sore mouth and gums‚ and lessen coughs. Garlic bulb extract‚ which is believed to be an antibiotic. Forsythia suspensa‚ which is a Chinese herb that may help alleviate mild allergic symptoms while reducing inflammation. 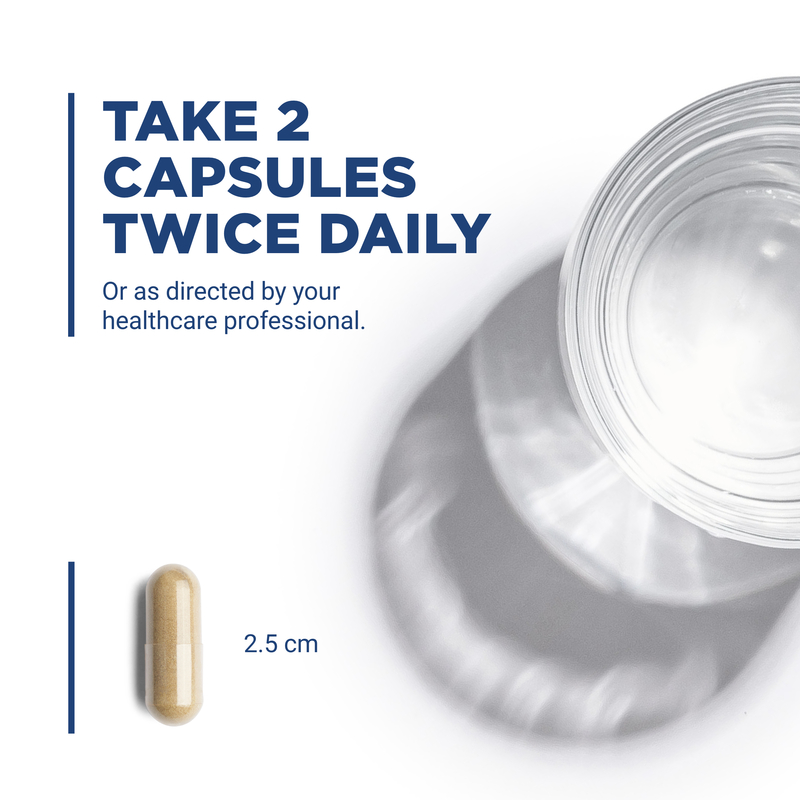 Taking two or three capsules‚ 3 to 4 times daily with food‚ or as recommended‚ means that each immunity-boosting 120-capsule bottle of Herbal Biotic by Vital Nutrients carries a supply. 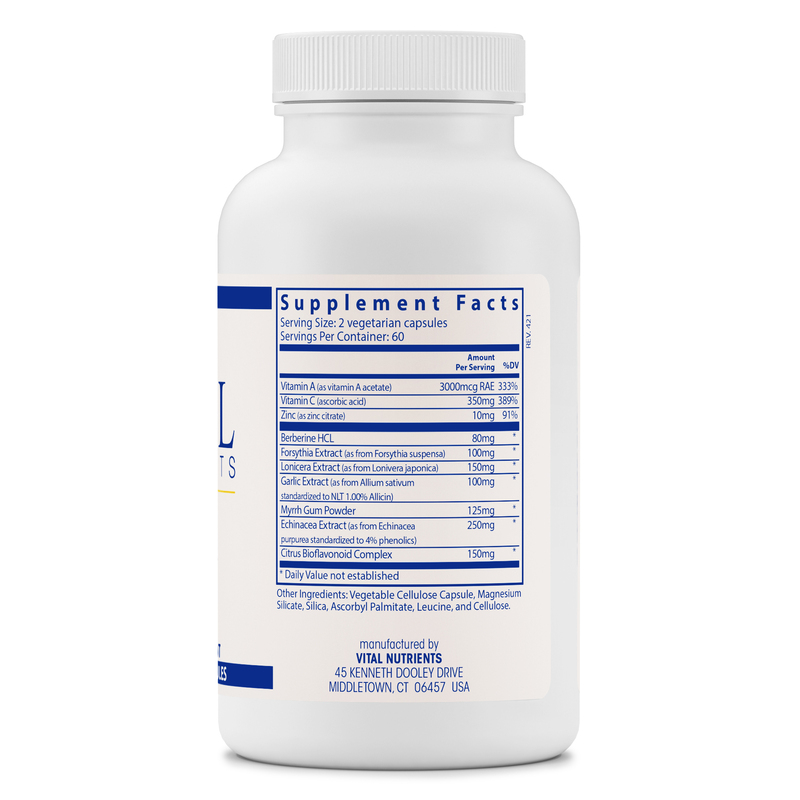 This supplement does not contain any coatings‚ binders‚ or preservatives. 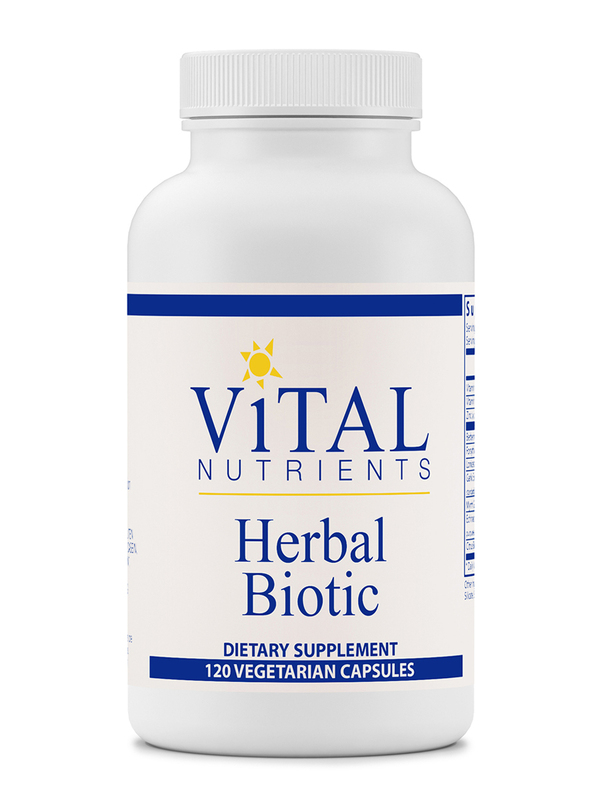 I use Herbal Biotic by Vital Nutrients all the time when I feel I start to get sick. My naturopath suggested use the first time. I had really bad cold for three weeks, I took several pills a day as it says on the bottle. It took some time for me to recover but overall, it worked awesome. I got my husband hooked on it too! I always keep it handy in my medicine cabinet and use with Oregano oil to combat any virus/sickness! My doc. told me to take Herbal Biotic from Vital Nutrients to help get over the end of a cold, It did seem to help! 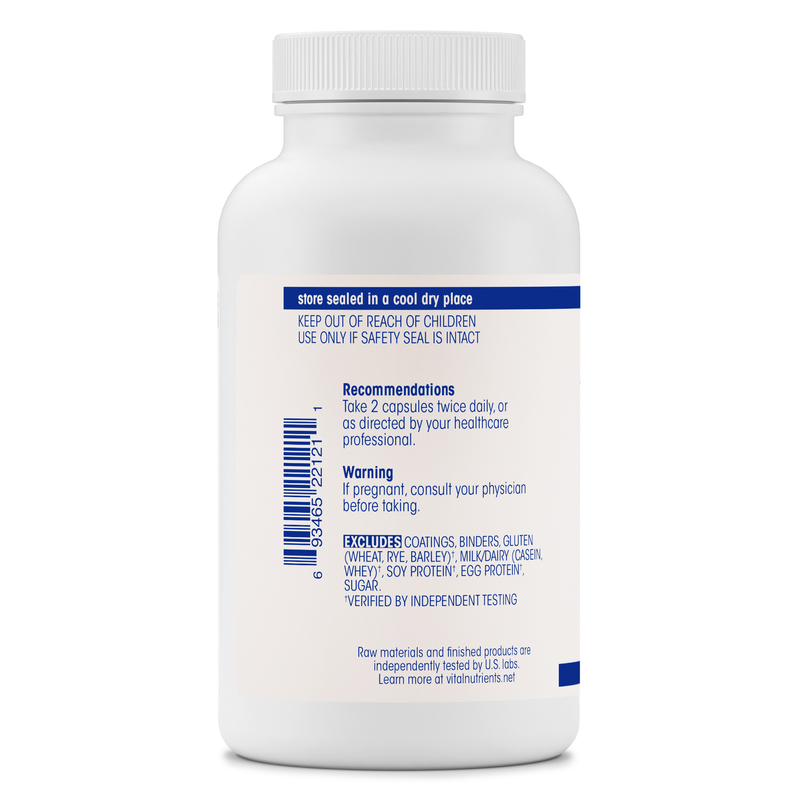 Easy to take and has a lot of immune support. A little pricey, and you need to take several a day. Herbal Biotic has been a wonderful natural "staple" in our familys natural medicine chest! I have used it for the last few years and it works. As a teacher I was able to avoid all colds and flu from my students during the winter months. My elderly parents use it in place of a flu shot. If you happen to catch a cold it will shorten the length and decrease the intensity of that cold. I wholeheartedly recommend Herbal Biotic! Since Herbal Biotic is a herbal biotic you need to balance it with a pro-biotic! Everything! The garlic potency! The fact that it works! My husband has taken Herbal Biotic and he got rid of a bad cold real fast.